The federal government went into shutdown at midnight, after a key vote in the Senate fell short of the necessary support to keep the government open. Democrats are far more concerned with Illegal Immigrants than they are with our great Military or Safety at our dangerous Southern Border. They could have easily made a deal but decided to play Shutdown politics instead. #WeNeedMoreRepublicansIn18 in order to power through mess! This is the One Year Anniversary of my Presidency and the Democrats wanted to give me a nice present. #DemocratShutdown For those asking, the Republicans only have 51 votes in the Senate, and they need 60. That is why we need to win more Republicans in 2018 Election! We can then be even tougher on Crime (and Border), and even better to our Military & Veterans! #AMERICA FIRST! Trump – despite his crassness, lack of experience governing and showboating – was supposed to be our dealmaker-in-chief. Instead, he rejected a bipartisan deal on DACA and has refused to ensure our military has the long-term certainty of an actual budget. We have a Republican House, Senate and White House and yet they can’t govern. It’s time they stop using our hallowed institutions as a political pawn. 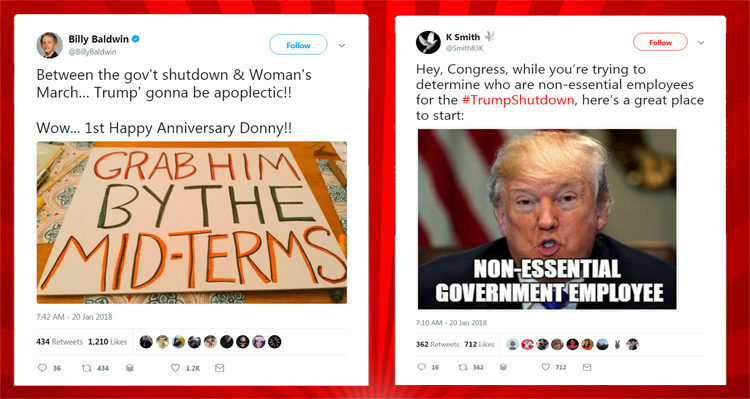 Rep. Lieu also referenced two trending hashtags in his tweet – #TrumpShutDown and #DoYourJob. As The Hill reported this morning, the first hashtag was trending before the failed Senate vote Friday night with Democratic leaders such as Rep. Nancy Pelosi using it to tweet about the funding battle. A hashtag linking a potential government shutdown to President Trump became the top trending topic on Twitter on Friday night. #TrumpShutdown, a hashtag used by Democrats ahead of Friday night’s deadline for Congress to pass a government spending bill, shot to the top of Twitter’s “Worldwide” trending topics. Between the gov't shutdown & Woman's March… Trump' gonna be apoplectic!! The GOP controls every branch of govt. I repeat: They control the WH & Congress. They've lurched from crisis to crisis for months w/o funding disaster recovery, health centers or children's health care. All while Dreamers hang in the balance. This is no way to govern.